Sodium hydroxymethylglycinate is a chemical preservative that is commonly used to inhibit bacterial or fungal growth in natural cosmetics. An entry published on the Truth in Aging website notes that the preservative is touted for its capacity to cover a broad range of microbes and fend off bacteria, yeast and mold. Producing the compound is known to require a number of synthetic processes. 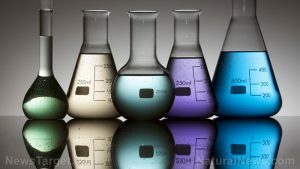 The chemical is characterized by its rancid smell that is often diluted or masked by other ingredients. Sodium hydroxymethylglycinate is used as an alternative to parabens in the production of cosmetics and skin care products. According to an article posted on the Truth in Skincare website, the compound is touted to facilitate the preservation process in various products by releasing formaldehyde and glycine, which may lead to a plethora of health woes. Sodium hydroxymethylglycinate is a formaldehyde-based chemical, which means that it is highly carcinogenic and may trigger the onset of other serious conditions. A news article featured on the Fox News website cautions that exposure to formaldehyde-containing chemicals such as sodium hydroxymethylglycinate may cause severe allergic reactions, which in turn may negatively impact the respiratory system’s overall health. Likewise, the chemical is known to affect the central nervous system and trigger the onset of headache and nausea. Ingesting the hazardous chemical is also known to be detrimental to the body’s digestive profile. According to the open chemistry database Pub Chem, swallowing the carcinogenic chemical may cause acute oral toxicity. The article also cautions that direct skin contact may induce severe skin allergies. Moreover, sodium hydroxymethylglycinate is known to particularly induce serious eye irritation and damage, and compromise the organs’ overall health. Various studies have also shown that the formaldehyde-based chemical may contaminate water ways and is detrimental to aquatic animals. A safety data sheet published by the Natural Ingredient website recommends that people who have inhaled the toxic chemical be taken to an area with fresh air and given artificial respiration if the victim is unconscious. It is also advisable to seek immediate medical attention should breathing become labored. Likewise, the entry discourages people from inducing vomiting if the hazardous substance has been ingested. The safety data sheet also discourages giving anything by mouth if the victim falls unconscious. Instead, the article suggests diluting the substance with one to two glasses of water or milk and seeking immediate medical assistance thereafter. The safety data sheet also recommends that people who suffered from direct eye contact with the chemical wash their eyes with plenty of water for up to 15 minutes and get health assistance should irritation persists. It is also advisable to wash the affected area if skin exposure occurred. The entry also recommends removing contaminated clothing articles and washing them thoroughly before reuse. Sodium hydroxymethylglycinate is particularly detrimental to the respiratory tract and the central nervous system. Likewise, the hazardous chemical is known to negatively affect the digestive tract, the eyes and the skin. According to an entry published on the Chemical of the Day website, sodium hydroxymethylglycinate is commonly found in cosmetics and personal care products such as shampoos, baby wipes and cleaning agents mas well as cleansing bars and lotion. Sodium hydroxymethylglycinate exposure may be effectively mitigated by avoiding products containing the harmful chemical. Sodium hydroxymethylglycinate causes respiratory tract allergies, oral toxicity, headache and nausea. Sodium hydroxymethylglycinate triggers severe skin allergies and eye damage. Sodium hydroxymethylglycinate particularly detrimental to the respiratory tract and the central nervous system. Sodium hydroxymethylglycinate negatively affect the digestive tract, the eyes and the skin.